During descent to Okisbil , the aircraft crashed in mountaineous area northwest of its destination at an elevation of approximately 8400 feet. It is believed there were no survivors. 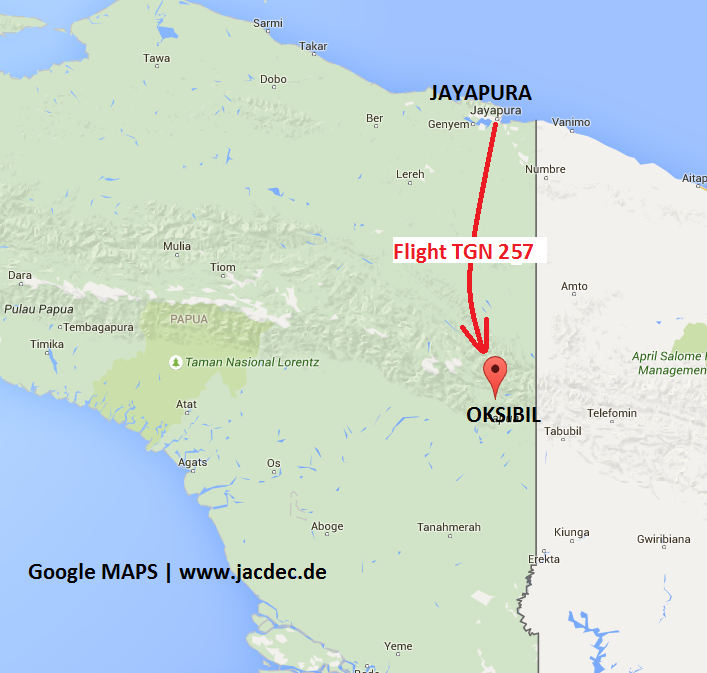 The aircraft went missing on a 55min scheduled passenger flight between Jayapura and Oksibil in eastern Papua Province after radio contact was lost 33 minutes after take-off from Jayapura. 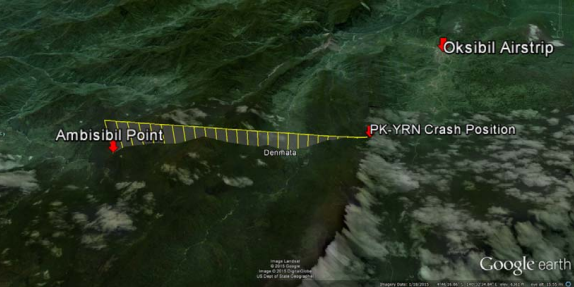 According to Indonesia Ministry of Transport, the flight TGN 257 has ended at the side of Mount Tangok, near Ambisibil about 12 km northnorthwest of Oksibil. A number of locals residets reported an aircraft hitting the mountainside. 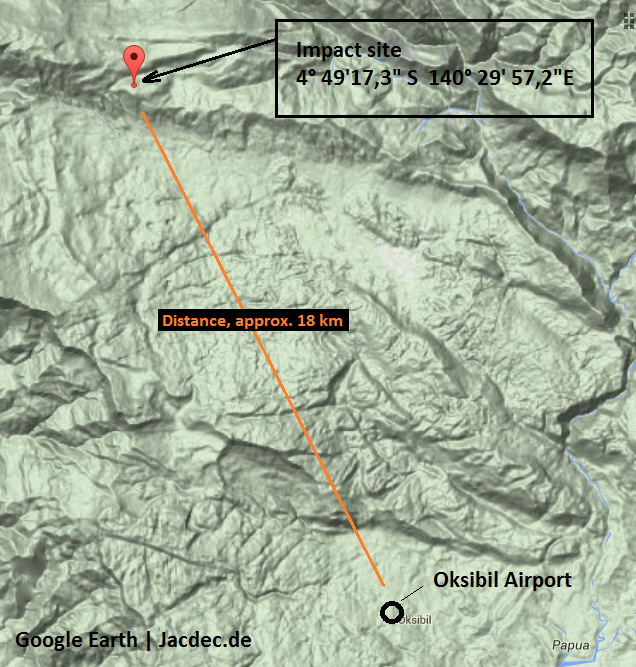 The impact site is situated in a remote and difficult-to-access area without roads. There were contradictory reports about the weather at the time of the accident, but its strongly believed that terrain was obscured by low clouds. Search for the missing aircraft was suspended in dusk and are due to be resumed the next morning. On Aug.17th, local police chief reported aircraft debris was spotted by an AMA (Associated Missionary Aviation) aircraft in heavily forested Bintang Mountains near the Oksop Waterfall. Rescue unites (over 200 people) had to abandon their attempts to reach the crash site because of adverse weather conditions. 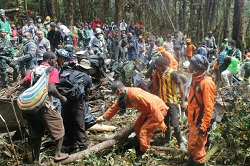 It is understood the wreckage is located in deep forest on a mountain about 18 Km northwest of Oksibil Airport at an altitude of 8.300 feet (about 4.300 ft above the elevation of its destination airport). On AUG 18th airline and rescue party officials reported rhge aircraft was totally destroyed and that there were no survivors. The black boxes were found to be in good condition and were removed for further examination. 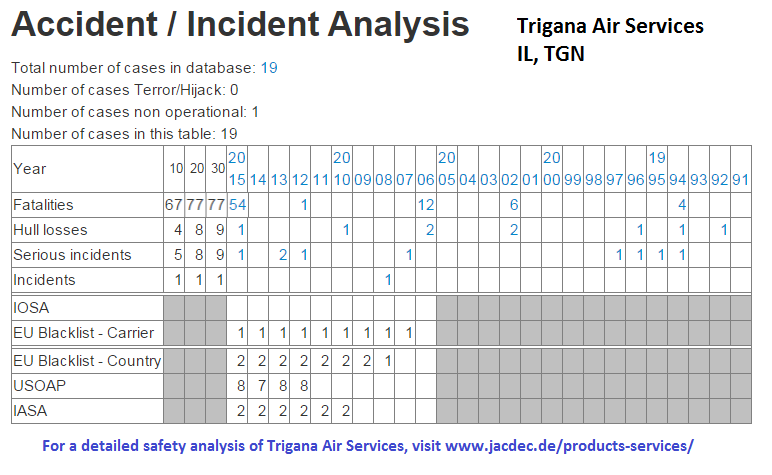 NOTE: in its 24 years of existance Trigana Air Service has lost eight larger aircraft in accidents in which 23 people died. (actual accident not included). The company is considered by JACDEC as a high-risk operator in terms of their general operating conditions. 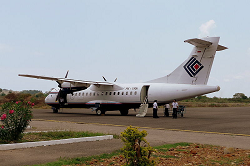 Since 2007, Trigana Air Service is among the EU Blacklist of banned airlines because of safety concerns.